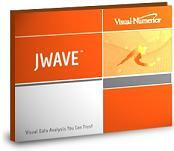 JWAVE™ is the PV-WAVE® Web Development Environment for network-based visual data analysis applications. With JWAVE's multiple graphics and visualization techniques, users can rapidly analyze, visualize and share critical information across the organization, regardless of the computer platform. JWAVE is based on a multi-tiered architecture that enables developers to easily create applications that embrace open standards and will grow as an organization grows. Whether developing applications using the Java programming language or HTML and Java Server Pages, JWAVE lets users perform numerical analysis and visual interpretation of large, complex data sets from all over the world by harnessing the power of the internet. Using the JWAVE Server users can create a centralized repository for updating and maintaining applications. The JWAVE Server handles very large data sets and allows storage of all application logic on the server, where it belongs. With this unique server, Java programs with JWAVE components can be run locally or over the Internet and intranet. Graphics, numerics commands and data are sent to the server, which retrieves both the numerical results and graphics and then displays the output. 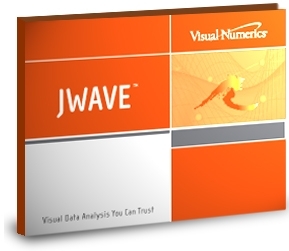 Using JWAVE's powerful graphics components programmers can easily create data visualization applications written in Java. Data and graphics commands are sent to a PV-WAVE server from a Java client. PV-WAVE then generates a graphics file that is returned to the Java client and displayed. If these plot components do not suit your needs, you can design your own. The Java source code for many of the Visual Numerics' components is freely available for you to copy and use as a template for creating new, custom plot components. Using JWAVE's numerics components, developers can send numerics commands and data from a Java client application to a PV-WAVE server. Results are then returned to the Java client. Any number of variables of any data type can be transferred between PV-WAVE and the Java program. With JWAVE, programmers can access existing PV-WAVE code and perform all of the operations normally performed with PV-WAVE. For example, developers might use the PV-WAVE Signal Processing™ package to write a Java-based signal processing applet. 咨询内容： That's a smart way of thninikg about it.